In July of 1975, Bruce Kotila was on the S.S. Edmund Fitzgerald and one of the crew members gave him a life jacket. Four months later on November 10th, the Fitzgerald sank in a Lake Superior storm. No one survived. Kotila, who lives in Rhinelander, says the gift is immensely meaningful to him 43 years later. Mackenzie Martin talked to Kotila and the author of The Wreck of the Edmund Fitzgerald about what still resonates with us about the Edmund Fitzgerald today. 43 years ago this Saturday, the S.S. Edmund Fitzgerald sank in a Lake Superior storm. The entire crew of 29 men died and it was one of the worst storms Lake Superior has seen with waves up to 35 feet high and winds up to 75 miles per hour. The Fitzgerald carried iron ore from mines near Duluth to other Great Lakes ports and the exact cause of the sinking remains unknown, though there are many theories. Locally, we remember it as the biggest ship to ever sink on the great lakes, but the story received national attention because of singer-songwriter Gordon Lightfoot. Bruce Kotila is a local doctor in Rhinelander and everytime he hears “The Wreck of the Edmund Fitzgerald,” it takes him back. “I can picture the ship in the harbor, in the mess hall, talking with those guys,” he says. When Kotila was young, he moved to Ashtabula, Ohio on Lake Erie and he’d see ships like the Edmund Fitzgerald pass by. The bell from the SS Edmund Fitzgerald on display at the Great Lakes Shipwreck Museum, located at the Whitefish Point Light Station in Michigan. When Kotila was in his 20’s, he was working with the Penn Central Railroad. One of his jobs was unloading the very same ships he used to gaze at as a kid. So they go down to the dock and it just so happens that the Fitzgerald was in. Kotila thought they should go and see if they knew anyone on board. So they do, and they end up in the ship’s mess hall having coffee with a bunch of young guys on the crew. And that’s the story of how Bruce Kotila was given a life jacket off the great Edmund Fitzgerald, four months before it was lost forever en route to Whitefish Bay. The life jacket itself is orange, stamped with the name Edmund Fitzgerald. For Kotila, it brings about strong memories of a specific time in his life, memories of unloading ships on Lake Erie and the camaraderie the crew members shared. 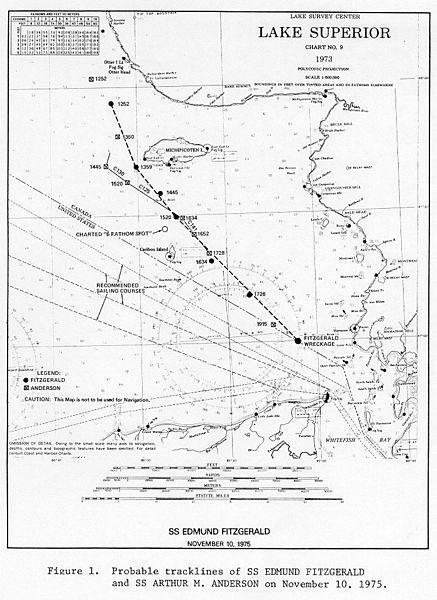 The National Transportation Safety Board map of probable course of Edmund Fitzgerald and Arthur M. Anderson. Though we can never really know for sure why the Fitzgerald sank, there is recorded radio communication from that night. Frederick Stonehouse is a maritime historian in Marquette, MI, and author of the book, The Wreck of the Edmund Fitzgerald, which covers the research and theories that have come out over the years. He says listening to that audio is chilling. Stonehouse says part of his job is trying to make sense of an event like this, to understand why it still resonates with people and matters today, when so many other shipwrecks have faded from the public’s mind or were never really there to begin with. The other thing that’s important to remember about shipwrecks like this is that it really does make things safer. After the Fitzgerald sank, an investigation from the National Transportation Safety Board resulted in 19 recommendations for the Coast Guard and four recommendations for the American Bureau of Shipping, eventually making shipping on the Great Lakes safer. Tomorrow, Frederick Stonehouse will be speaking at Mariner’s Church in Detroit, MI. Some of the family members from the crew of the Fitzgerald will be there. Different communities around the Great Lakes will also be holding memorials for the crew. They’ll ring a bell 29 times for those lost. Then one more time for all of the other men and ships lost on the Great Lakes.